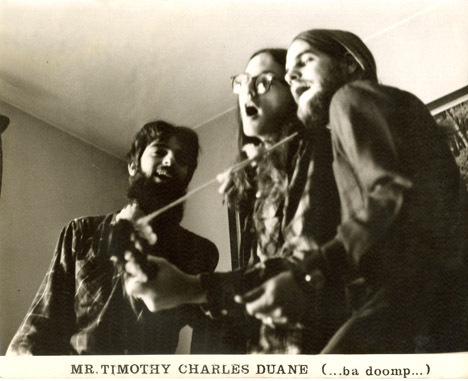 Mr. Timothy Charles Duane…ba doomp… was born on Labor Day, 1969, when Timi and Duane arrived at Charlie’s house with a song they wanted to play for him. The song, “I Can’t Wait,” was written for a guitar and two tubas but since there was a clarinet sitting around Duane figured out how to play one of the lines. Knock knock on Charlie’s door and there he is playing the piano, while simultaneously playing another clarinet, working on his own song. Charlie learned the harmony part for “I Can’t Wait” (the second tuba line) on his clarinet. That afternoon, they busked at the local hamburger joint, Wetson’s, taking in 57 cents. The three guys began a musical relationship that would last for another decade… and continue with many anniversary shows.